We spent the morning watching the sunrise over the Costa Rican shoreline. While the bravest surfers were out there riding eight-foot waves, my friend and I were perfectly happy with a warm cup of tea and some peaceful silence. We sat, bare toes deep in the sand, mesmerized by the sky as it changed from pastel pinks and oranges to a deep, cloudless blue. Another flawless morning in paradise. Once the sun was high in the sky, we returned to the hotel. My friend grabbed her swimsuit and announced that she was heading to the pool to build her tan. Meanwhile, I settled myself on our balcony, opened my computer, and started reading emails. “Working in a place like this” was exactly what attracted me to travel writing in the first place. I couldn’t stand the prospect of a morning commute, nine-to-five under oppressive florescent lighting, and two-weeks of vacation; just enough time to glimpse a place before being pulled back to the daily grind. I wanted more freedom than that. I wanted a life where my office was wherever I wanted to be and pre-determined norms regarding “vacation time” did not dictate when or where I was able to travel. I did attempt to make the traditional nine-to-five life work at one point, but I quickly realized the typical two weeks off was never going to be enough to satiate my wanderlust. So, I chose a less traditional path and decided to build a career as a digital nomad. As a travel writer I’m able to settle into a comfortable income and a lifestyle that gives me the freedom to constantly explore. That morning in Costa Rica, my friend pitied me for having to work while in the beauty of Costa Rica. She was in Costa Rica for ten days and would be returning to the States and to her job as an office manager at the end of the trip. In her mind, we had precious little time in this stunning country and it was a shame to waste it on my computer. I explained to her that, for me, there was no returning to the office at the end of the trip. The trip was my office. I lived in Costa Rica for two months. 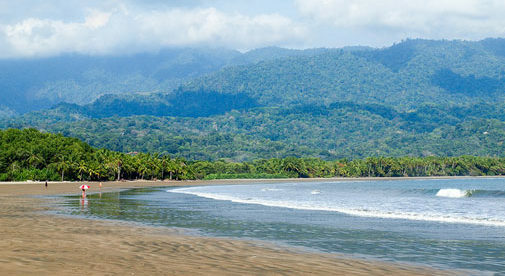 And yes, some of those days were spent on the computer typing up articles, but many of those days were also spent hiking to the top of Monteverde and immersing myself in the mystical cloud forest, searching for sloths in the rainforest, and finally learning how to successfully surf a wave. Over the years, my “office” has featured parrots cawing from a nearby palm tree, Swiss Alps rising to meet the heavens, northern lights dancing across the sky all night long, and many more breathtaking destinations that sit untouched on the bucket lists of others. As a travel writer, your work goes wherever you go. Which means, as a travel writer, you can go anywhere. At the end of the day, I will never complain if I’m answering emails from a café at the base of Machu Picchu, because it sure beats answering emails from a cubicle.